Baseball is in very good condition. The only flaw is the ball. The seam stitching is unique - Yankee Blue. Up for sale is a lightly toned Gene Budig baseball with original box though the box has wear. 1.00 extra for each CD and graded card. THE BALL IS IN GREAT SHAPE CONSIDERING THESE BALLS WERE PRONE TO TONING. THIS WAS BOUGHT NEW IN 1996. Dynasonic Mickey Mantle Auto Alarm. Antique collectible auto alarm, fully functional. Please read photos for an exact description. Box is in poor condition. Ball is in excellent condition with very minor surface wear. 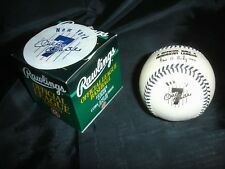 Baseballs are in original boxes with the original #7 stickers on each one. However, the balls have never been out of their individual boxes. Case bvox shows light wear and has "5 each" written in marker on the inside. THE BALL IS IN GREAT SHAPE CONSIDERING THESE BALLS WERE PRONE TO TONING. BOX WAS OPENED FROM THE BOTTOM SO I COULD TAKE PHOTOS. B OX IS IN EXCELLENT SHAPE. This baseball is the special black stitched OAL baseball featuring Mantle's facisimile signature, pinstripes, and iconic number 7 on the side panel. This baseball is new without the box. A WONDERFUL 1960'S MANTLE BASEBALL FOR YOUR COLLECTION! Makes a great gift for collectors and any baseball fan. See photos for details. MICKEY MANTLE Art Portrait Baseball. Mickey mantle baseballs with stand. Mickey Mantle, Brooks Robinson,Billy Williams,Ken Boyer,Bill White,Jim Lefebvre,Rick Reichardt, & Tony Conigliaro are on this Dozen Balls.Rather unusual and rare to see as Many as a Dozen together. Also,in this Sale they all are in remarkable condition, considering they are 53 years old. Snow white, no toning, no stains. You will receive this baseball in it's original Rawlings box, removed for photo purposes. HELLO BOYS AND GIRLS! YOU PICK AND CHOOSE, YOU MIX AND MATCH. THE CARDS HAS BEEN GRADED A 10.0 GEM MINT.FOREVER. THESE ARE ALL MY OTHER LANDSMAN CARDS I HAVE:::. 3 very nice MICKEY MANTLE 1985 FANTASY CAMP PHOTOS.these are COPIES of Photos I took. Certified Mickey Mantle Picture and baseball. The signature on the baseball is in great condition, the photo is slightly faded. MICKEY MANTLE, WILLIE MAYS, & DUKE SNIDER AUTOGRAPHED RAWLINGS NATIONAL LEAGUE BASEBALL. WILLIAM WHITE - PRESIDENT. The box itself does have a sticker on the top left section of the front of the box. OFFICIAL RAWLINGS. MICKEY MANTLE. New York Yankee. Willie Randolph Signed Auto Autograph Rawlings Baseball - B110. Shawn Abner Signed Auto Autograph Rawlings Baseball - B109. Eric Chavez Signed Auto Autograph Rawlings Baseball - UDA - B98. John Franco Signed Auto Autograph Rawlings Baseball - B110. The box is not sealed. The sweet spot of the ball has a star on it. The box is not sealed. 1953 Mickey Mantle Baseball Life Stories "How they made a Big League Star" Vintage Look Cardboard Poster 22"x14"
Rawlings Mickey Mantle Official American league Baseball . Shipped with USPS Priority Mail. A 4th set would require a new box and would incur and addition 13.99 up to. I IMAGINE THESE ARE PRETTY RARE. We will respond during these hours. All attempts are made to represent each item in an honest and forthright manner. Part Number: Mickey7Mantle. ITEM TITLE.